There are so many ideas of what comic book readers are like plastered all over the media from TV shows such as the Big Bang Theory, so many stereotypes about being a ‘geek’ or to use the American term ‘nerd.’ But what really is a ‘comic book geek?’ Do we have a right to label a group of people based on their interested of a comic book in the 21st century? I thought this stereotype disappeared the older you got, until recently. Now I’m twenty I rarely bother to leave out information about myself around my peers, they can think what they want of me. I mentioned to one of my friends that I read graphic novels and comics in conversation and her reply was a short laugh and ‘I just didn’t expect you to read them.’ I think that just about proved that the stigma around colourful short storybooks is still very much alive. As I’ve grown up my tastes have developed and I no longer read as many superhero comics as I used to, instead choosing graphic novels based on the lives of gods or super-humans or outcasts. These started to interest me much more and keep my attention for longer as the stories are all there in one or two novels. I don’t often delve in to a graphic novel but more recently I’ve had time to sit and admire the art work and really focus on the story. I’ve fallen in love all over again. 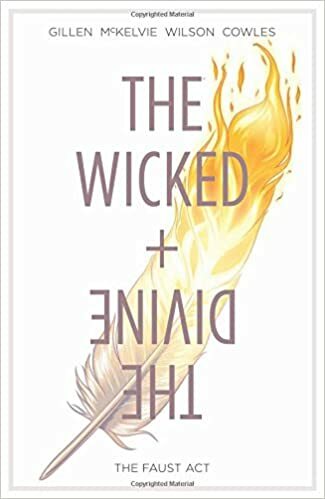 I sat down one afternoon and read through the first volume of The Wicked and the Divine. At first the centre around gods intimidated me and I wasn’t sure if it’d be something that I would enjoy. Luckily I’ve fallen head over heels for this series. The art work is truly phenomenal and the storyline keeps you completely gripped. It’s easy to follow (as long as you’re good at remembering names) and flows so nicely between the pages. I think The Wicked and the Divine is the perfect graphic novel to get back in to reading them. The second volume was released in July and I’m eagerly awaiting its arrival to my doorstep this week! What I’m trying to say is that you cannot judge a person by what they’re reading. I’m a YA contemporary kind of person mostly, but that doesn’t mean that I can’t love the artwork and layout of a graphic novel just as much. Now that there are so many exciting stories in graphic novels and comics not just superheroes, I think it’s very hard to put all comic book readers under one category of what you expect them to be like. I’m quite a girly twenty year old, I don’t spend every Saturday in comic book shops, I definitely have no interest in gaming tournaments, I don’t own a t-shirt with any kind of marvel character on it (okay sorry Spiderman is my only weak spot there) but it doesn’t mean I can’t enjoy a graphic novel!